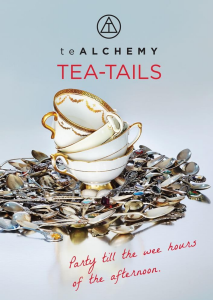 Win TEA-TAILS & Tea Gift Set from teALCHEMY! Lynda Budd is a tea alchemist and the ambassador of ‘teALCHEMY‘ a tea brand that focuses on educating through a non-traditional approach about the different ways one can incorporate tea into their lifestyle . She is passionate about spreading the word on a more modern use of tea. Lynda’s book ‘TEA-TAILS’ does just that…it ’s full of great recipe ideas that go above and beyond the traditional brew! Use teas in baked goods, gourmet and every day meals, and yes EVEN COCKTAILS! Are you a tea lover? What tea inspired cocktail / mocktail…would you concoct? Long Island Iced Tea?? – whoops that’s been done! How about something calming and soothing for when the kids are home on March Break? Maybe something fun for the Spring (yes it should be coming soon) or cool and refreshing for those hot summer afternoons (yes…those should be coming too)? Tell us your TEA coctail/mocktail idea and WIN “Tea-Tails” AND a tea gift set from teALCHEMY. Start your tea adventures today! Send an email to info@whatshesaidradio.com with “tea-tails” in the subject line. Share your own tea cocktail/mocktail idea with us for your chance to win! Contest ends FRIDAY MARCH 13th!